Merry Christmas! My gift to you: these vintage photos of Cory and me with matching shirts. We’ll have a video for you tomorrow. Our champ rolled the dice on that True Daily Double – it was the $2,000 clue, and the first picked in the category – but it paid off handsomely. That’s how you play the game. 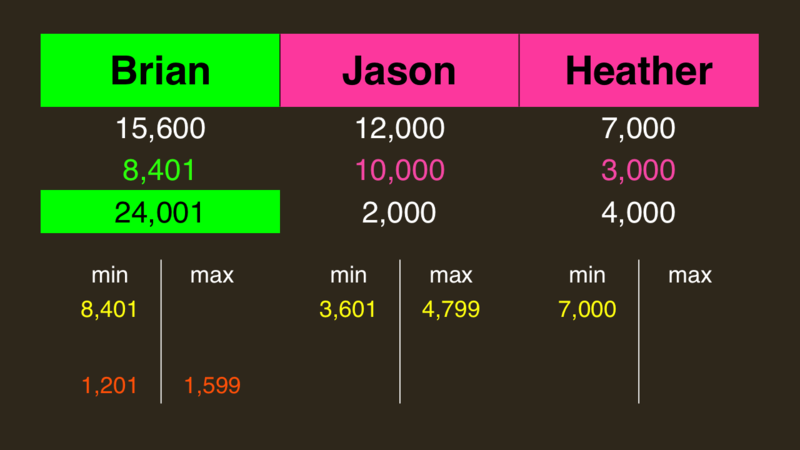 Quick note: Brian and Jason are separated by 3,600, which means Heather would need 7,200 to have a chance to win on the triple-stumper. If Jason doubles his score, he’ll have 24,000. 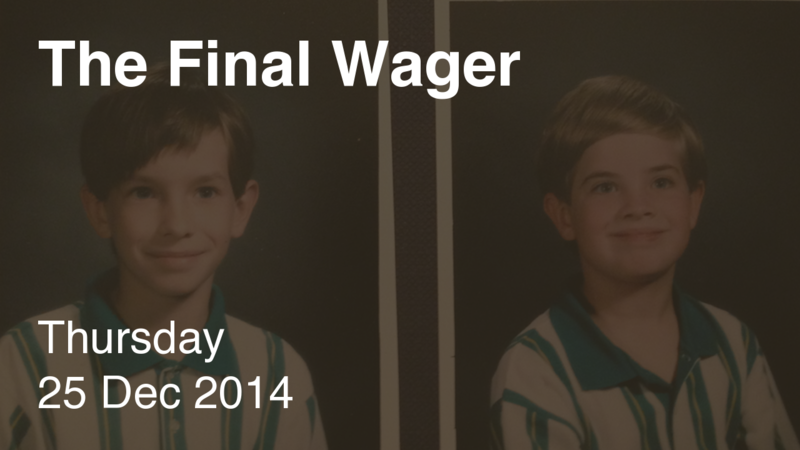 To cover this all-in wager, Brian will need to wager 8,400. An incorrect response with that wager will leave Brian with 7,200. 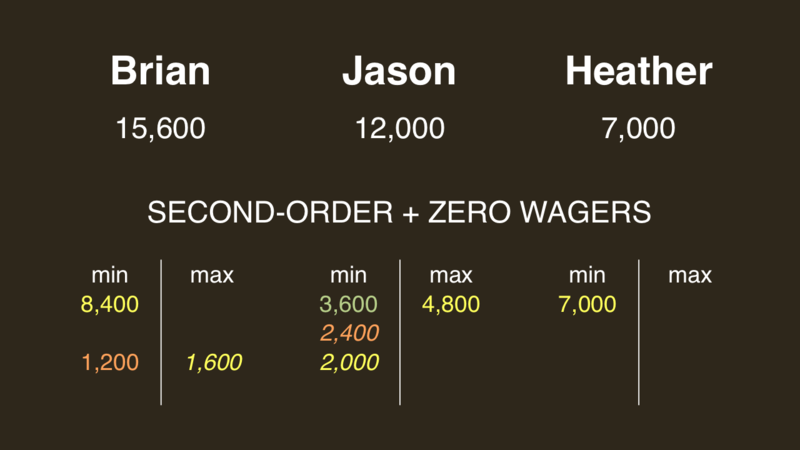 To stay above his total, Jason can wager up to 4,800. Heather must respond correctly to have a shot, so all-in is the way to go. A successful doubling will put Heather at 14,000. To cover this, Jason should wager at least 2,000. Brian could wager at most 1,600. We’ll put that at the bottom to show it’s sub-optimal. 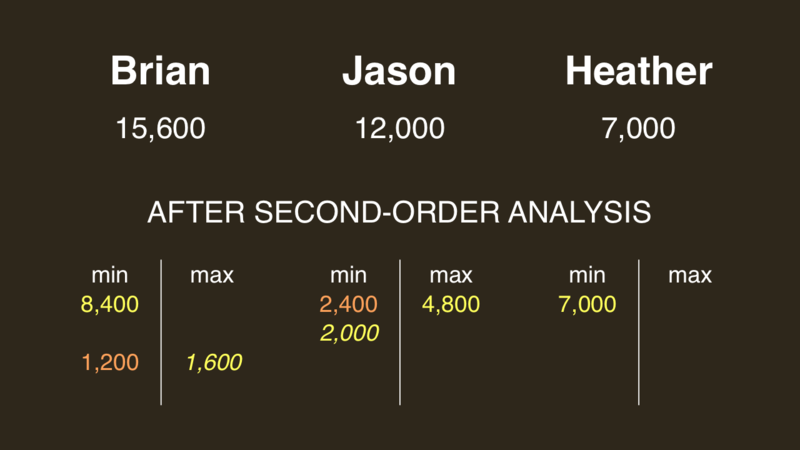 If Jason makes the rational maximum wager of 4,800, Brian will need to wager 1,200 to cover him. That goes with his 1,600 maximum from the first part. If he’s wrong with that wager, he’ll be left with 14,400. In that case, Jason would have to wager 2,400 and respond correctly. We’ll put his 2,000 minimum from earlier in italics just in case we can pair it up with something later. 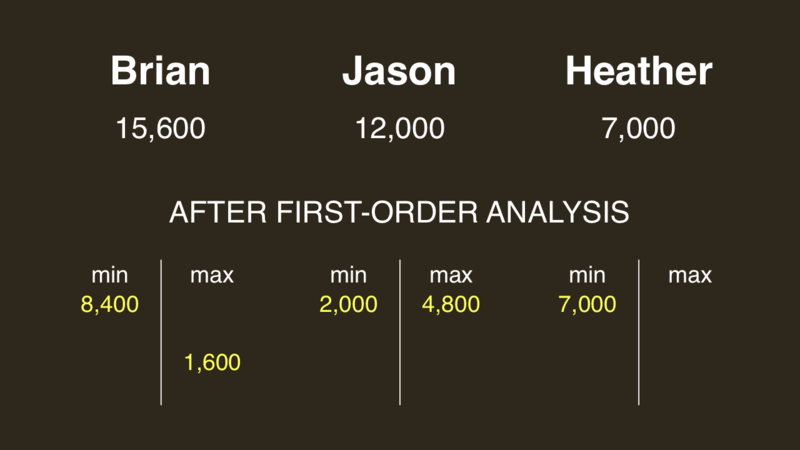 As I noted, Brian and Jason are separated by 3,600, so Jason should make that his minimum. We can now get rid of the 2,000 and 2,400 amounts because there’s nothing paired with them. On occasion, it might make sense for Jason to wager big. But Brian has only two good options: to lock Jason out and to stay above Heather. In either case, Jason can win with a wager in that single range. Thanks, Blake! Same to you. See my 12/23 comment for details. In the last 10 games (counting tonight) we have the following result: In 1 case all three got it right = easy. 6 cases of 1 right + 2 cases of 2 right = 8 ok and 1 cases of 0 right = hard. So that’s a “final jeopardy degree of difficulty = just right” score of 80%. We are accumulating a lot of “1 right” cases, enough to drop out of the butter zone.